Office Space - Angers, Maine et Loire. 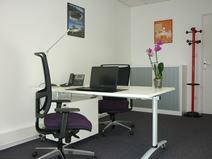 Close to all local transport links in Angers this business centre offers both privatye and coworking flexible office space in light and spacious rooms. Tenants have access to great amenities including on-site parking and fully equipped meeting rooms with conferencing technology. Within 10 minutes walk, you can find Grenier Saint Jean- a beautiful venue in which to host networking events, awards and conferences.